WASHINGTON, March 16, 2016--The qualifying period for the 2016 Washington International Horse Show (WIHS) Equitation and Children's and Adult Championships is currently underway, and riders are earning points early in the season competing in winter circuits around the country. The Finals will be held Oct. 25-30 at the 58th Annual Washington International Horse Show at Verizon Center in Washington, D.C. Qualifying events for the popular equestrian series are held at more than 650 horse shows in North America. Riders earning the most points throughout the year are eligible to compete in the WIHS Championship Finals, which include the $10,000 WIHS Children's Hunter Championship, $10,000 WIHS Children's Jumper Championship, $10,000 WIHS Adult Hunter Championship, $10,000 WIHS Adult Jumper Championship, WIHS Equitation Finals and WIHS Pony Equitation Finals. With six months remaining in the qualifying period, which ends Aug. 31, there is still ample time to qualify for the Finals. Riders must be active WIHS members in order for points to count towards the Finals. > Sign up today at www.wihs.org/membership. Andre Dignelli of Heritage Farm, Katonah, N.Y., is training a number of hunter, jumper and equitation riders as they seek to qualify for the WIHS Finals, including current east coast equitation leader Sophie Michaels of Deerfield, Mass. Dignelli has had several top riders win the WIHS Equitation Finals over the years, including Kent Farrington, currently ranked the #3 show jumper in the world, Addison Phillips, Samantha Schaefer, Lillie Keenan and Victoria Colvin, last year's winner. "I think it is a special class because it happens in a major city, which gives it a special atmosphere," said Dignelli about the WIHS Equitation Final. "It has become quite difficult to qualify, which also adds to the atmosphere. It highlights a rider's ability to ride a hunter and a jumper, and that diversity is important." Sophie Michaels of Deerfield, Mass., currently leads the WIHS Equitation East Coast standings with 1,748 points.Annabel Revers of Weston, Mass., is second with 1,728 points, and Mckayla Langmeier of East Granby, Conn., is third with 1,604 points. The top rider in the West Coast standings is Hunter Holloway of Topeka, Kan., with 2,744 points. Sydney Hutchins of Westlake Village, Calif., is second with 1,420 points, and Ransome Rombauer of St. Helena, Calif., is third with 944 points. In the WIHS Pony Equitation standings, Jordan Cobb of Austin, Texas, is leading with 1,014 points.Tessa Downey of Houston, Texas,is second with 449 points, and Anna Robson of Dallas, Texas, is third with 446 points. In the Children's Hunter Championship,Costar and Helen Lohr of Warrenton, Va., have the lead with 854 points. Norway de la Fosse and Indya Vankirk of Watkinsville, Ga., have 700 points for second place, and Finally Found and CeCe Siegfried of Tulsa, Okla., are third with 650 points. Frontman and Charlotte Williams of Fulton, Md., currently lead the Adult Hunter Championship standings with 898 points. Overseas and Mindy Wurzburg of Memphis, Tenn., are second with 766 points, and Benvolio and Mary Grossman of Burlington, Wis., sit third with 666 points. 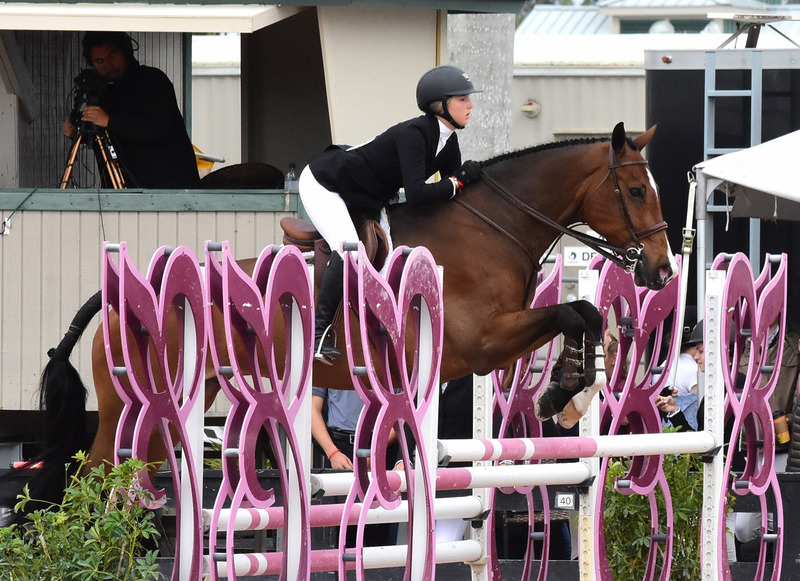 In the Children's Jumper division,Mimi Gochman of Palm Beach, Fla., and Windelinde are well on their way to qualifying for the championship with 1,485 points. Anna Claire Smith of Atlanta, Ga., and Bilbo Baggins hold 1,407 points for second place. Phoebe Alwine of Delray Beach, Fla., and Zenith Dance are currently third with 1,323 points. The Adult Jumpers are also earning points to qualify for their championship finals in October.Bonapart and Lindsey Tomeu of Wellington, Fla., have 2,320 points to lead the division.Bonitha and Sarah Gordon of Stamford, Conn., sit second with 2,091 points, and Feu d'Amour and Mary Kate Olsen of New York, N.Y., have 2,032 points for third. Don't miss the chance to qualify for the WIHS Championships. WIHS looks forward to hosting the best horses and riders from around the nation in 2016 and encourages all riders to continue their drive to qualify. > For more information or to sign up to earn points for the WIHS Championship Finals, visit www.wihs.org/membership.